It is 3 degrees above zero this morning and the sun is not up yet. That is cold friends and I have been working to finish a project I stated yesterday, a second dog door for our beloved dog Molotov (Molly for short). Here is the deal. Molly is getting old, over fourteen years, which is old for a pup. The sad part is he is on pills, and the pills make him drink a lot of water, and the water makes him pee, and he can't hold the pee all night. Sound familiar to some of you? animals, rehabilitating them for the wild. So she raised the whole litter in the bottom of an old sleeping back by herself, and Molly was one of those pups, which she kept. Having been raised under covers, Molly, to this day, likes to get under any blanket he can find. Often, there is just a tail sticking out. May and Molly traveled all over North American when May was busking on the streets of not only the Midwest, but both coasts, writing and singing her songs. May is now very well known in the Midwest and famous singers have song her songs. But Molly was retired years ago when it became impossible for Molly to be in the clubs, auditoriums, and festivals where May performed. I took Molly in and made May sign adoption papers that I downloaded from the Internet. Molly has ridden freight trains, hitchhiked, and walked all of this country, protecting May from harm, and serving as her best companion for many years. Now in retirement, he deserves a dignified retirement, and we love him so very much. He mostly lives in my office, and sleeps on the couch there, the only couch he is allowed up on. He and I frequently take naps together and when it gets very cold out, he wants to be under the covers with me. I let him, but I have to scooch over to one side, of course. Back to the project. Molly has a dog door in the outer screen door (no screen in this weather) to the outside, but because it has been so cold, if we leave the inner door open, too much cold air comes into the house. The long and the short is that when Molly can't hold it any more, he pees wherever he can. And can be hard to clean up, depending on where it happens. It is not fair scolding him, because there is nothing he can do about it, so it up to us to "do about it," which I have been. 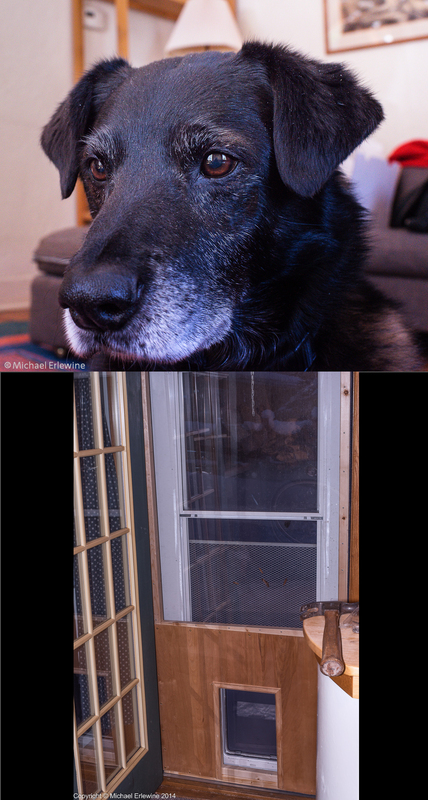 My idea was to build a full-framed dog door insert between the screen dog-door and the inner door, so the most of the time, if needed we can leave the inner door open and still have the equivalent of double-pane cold-stopping action, i.e. two dog doors. So here is a shot of Molly, and a poor shot of the new dog-door insert. You can see the outside screen door, but what you can't so easily see is that you are looking through a sheet of clear Lexan in the insert I just built. No, I am not going to quit my day job. And someday I am hoping May will write a song about her faithful companion.